The Spirit of God comes over Saul. My thoughts: Aren’t these the same people who just celebrated when God made Saul their king? Their first response is to make a treaty with the enemy without even contacting their king! 1 Samuel 11:4-7 (IEB): “The messengers came to Gibeah, Saul’s hometown. When they told the people the news, the people cried loudly. They wept. And look, Saul had just finished plowing in the fields with his oxen. When he heard the people crying, he asked, ‘What is wrong with them? Why are the people crying?’ Then they told him the words of the people of Jabesh. When Saul heard these words, the Spirit of God came over him. He became very angry. So, Saul got his team of oxen, killed them, and cut them up into pieces. Then he gave those pieces of the oxen to the messengers. He ordered them to carry the pieces throughout all the land of Israel. The Messengers made this announcement to Israel: ‘This is what will happen to the Oxen of anyone who does not follow Saul and Samuel!’ This is how Yahweh shocked the people. They all came out as if they were one man! My thoughts: The people of Israel had wandered so far away from putting their trust in God that He had to do something shocking to get their attention! As I leave my study today, I have to ask myself “when I face trouble do I turn to God first? Or do I try to negotiate a compromise with the world like the Israelites of Jabesh tried to do with Nahash?” God wants me to trust in Him! And He is willing and able to do something shocking to get my attention! My prayer today is one of gratitude that He gave me this example so that I might put my trust in Him in the first place, and in His plan where it belongs. The victory belongs to the Lord! With God’s help, Saul (with Samuel’s backing) is set to rescue the people of Jabesh from Nahash the Ammonite. The next morning, Saul separated his soldiers into three companies. They broke into the Ammonite camp at dawn. And they struck down the Ammonites until the day got hot. The Ammonites who were still alive were scattered. Not even two of them remained together. My thoughts: Saul knew there were those of his own people who hated him. When Saul and his army won a decisive victory and the people wanted to celebrate his victory by killing the troublemakers in their own ranks, Saul wanted none of that! He wanted the people to focus on God who was really the one who delivered them. 1 Samuel 11:14-15 (IEB): “Then Samuel said to the people, ‘Come, let’s go to Gilgal. We will recommit ourselves to the kingdom.’ So, all the people went to Gilgal. And there, in the presence of Yahweh, the people confirmed Saul as king. They offered peace-offerings in the presence of Yahweh. And there Saul and all the men of Israel celebrated. As I leave my study today I am reminded that if I am doing God’s will, it doesn’t matter what anyone else thinks of me. And also; if I am not doing God’s will, but am still alive and breathing, it is not too late to recommit myself to Him. The Israelites had forgotten Yahweh, their God, but because of this great victory over their enemy, they are on the road to a right relationship with Him again. My prayer today is one of gratitude to God for His plan for my life, for the guidance of His Word, and the grace of His forgiveness when I fail, and repent. Samuel makes a speech to the Israelites. Saul and his soldiers had just defeated the Ammonites with Gods help, and had gone back to Gilgal to celebrate. The people confirmed Saul as king. Samuel reminded the Israelites that he was to be trusted to tell them the truth and they agreed that he had always been honest and no one had ever found any wrong in him. He reminded them that it was Yahweh who chose Moses and Aaron, who brought them out of Egypt, and caused them to live in Canaan. He also reminded them that their ancestors had forgotten Yahweh, their God. So, he allowed them to become slaves. When they cried out for help and admitted they had sinned by abandoning Yahweh, God sent Gideon. And, he sent Barak, Jephthah, and also Samuel himself. He (God) saved them from their enemies and they lived in peace. 1 Samuel 12:12-15 (IEB): “But when you people saw Nahash, the king of the Ammonites, coming against you, you said to me, ‘No, we want a human king to rule over us!’ even though Yahweh, your God, was your King. Now, look, here is the king whom you chose, whom you clamored for! Look, Yahweh has put a human king over you. You must revere Yahweh and serve Him. You must obey His commands. You must not rebel against Yahweh’s authority. 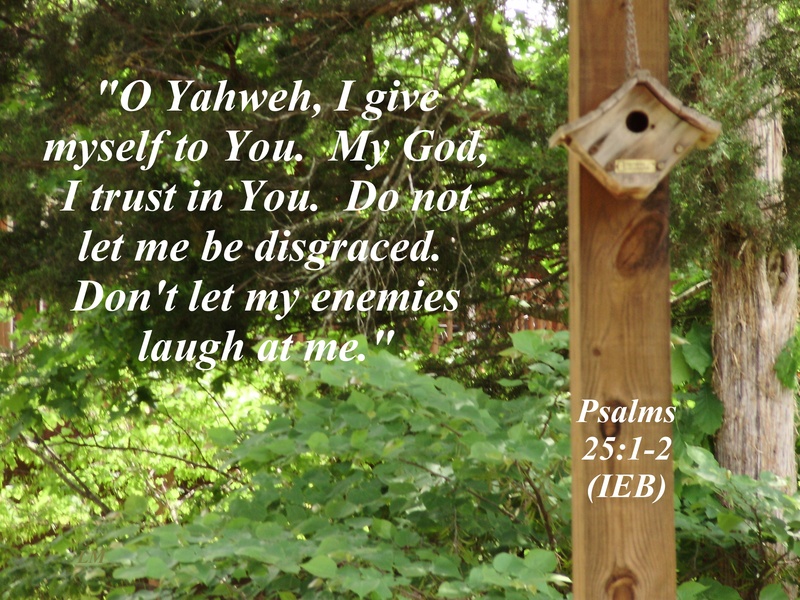 Both you and the king who is ruling over you must follow Yahweh, your God. If you do so, then it will go well with you. Samuel wanted to be sure the people understood that it was God who chose Saul – and it was God, not Saul that who was responsible for this victory over their enemies. 1 Samuel 12:16-20 (IEB) “Now, stand still and see the great thing which Yahweh is about to do in front of your very eyes. Today, it is the time of the wheat harvest, isn’t it? (It was the dry season. It rarely rained during this time.) I will pray for Yahweh to send thunder and rain. Then you will realize what an evil thing you have done against Yahweh, when you asked for a human king for yourselves! As I leave my study today, I can’t help but make a comparison to our world today and how the people and the government have rebelled against God’s authority. My prayer today is that we as a nation will stand up and repent before it is too late. After Saul (with God’s help) defeated the Ammonites at Jabesh he sent all but 3,000 of the soldiers back to their homes. Two thousand of these soldiers were with Saul in Michmash in the mountains of Bethel, and 1,000 of them were with Jonathan (Saul’s oldest son) in Gibeah. (f) or, “ram’s horns” (Hebrew: shofar) for the purpose of rallying supporters of the war effort. (Compare Judges 3:27; 6:34; 2 Samuel 20:1). This was the first significant act in their war for independence from the Philistines. The Philistines gathered to fight and the Israelites saw that they were outnumbered and were in trouble so they hid or crossed over the Jordan River, trembling in fear. (a) It was forbidden for Saul to do this; he was not Samuel, who was authorized to do so as a judge and a priest. Acting out of fear, instead of trusting God implicitly, as Gideon had done, King Saul presumptuously took matters into his own hands. (b) Michmash was approximately 2.600 feet above Gilgal in elevation. The Philistines had the clear advantage of being on the high ground prior to a battle. As I leave my study today I have to confess some empathy for Saul. He saw the situation disintegrating and thought he’d better do something! He tried to do the right thing (make the sacrifice) but he was not the right person to do it! And he will pay dearly for this! My prayer today is for the faith and patience to wait on God’s timing. God responds to Saul’s decision not to wait. (d) See 1 Samuel 25:30; 2 Samuel 6:21. 1 Samuel 13:15-18 (IEB): “Then Samuel got up and left Gilgal. He went up to Gibeah in the territory of Benjamin. Saul gathered together what was still left of his army – only about 600 men. (e) Geba and Gibeah were very close to each other. The text does not record Saul’s removal of his men from Gilgal, but the context demands that a move did occur. Saul regrouped his total military force by joining his son Jonathan at Geba to prepare for a major battle with the Philistines. (f) The Hebrew word for “raiders” means “devastators”. It is the same word used to describe God’s destroying angel in Exodus 12:23. The task of these three Philistine detachments was to wreak as much havoc as possible in order to intimidate the subjugated Israelites. As I leave my study today it is clear that God has written Saul out of his plan because of his lack of obedience. He clearly chose David because he would do the things that God wanted him to. My intension today is to be like David. (d ) literally, ‘three-pronged forks…and to set the goads’. When plowing the ground, the farmers needed a long, sharp point on the end of a stick to goad (that is to urge) and ox to go forward. 1 Samuel 13:22-23 (IEB): “So, when the day for battle came, the Hebrew soldiers who were with Saul and Jonathan had no swords or spears in their hands! (e) Only Saul and his son Jonathan possessed swords and spears. (f) The Philistine garrison evidently wanted to keep the Israelites under surveillance and to prevent any surprise attack on their camp or their fellow-soldiers in that region. It is clear that the Philistines were trying to keep the Israelites under subjection by forbidding them to have swords and spears with which to fight. This was not only a physical deterrent, but was a psychological deterrent as well. But they didn’t count on Jonathan’s trust in God. As I leave this study today, I have to ask myself if there is something I’m not attempting because the enemy has convinced me I can’t win? God expects my complete trust.